It is a long way from land-locked Berne in Switzerland to Tasmania, an island 240 kilomteres off the south coast of Australia. That is the journey that Peter Althaus made, as he travelled from 25 years as an engineer and Manger of IBM Zurich, to one of the most respected and iconic winemakers in the Antipodes. Althaus had always had a passion for wine. At age 25 he formed a tasting association in Switzerland, which swelled to 7,000 members, and saw him travel the wine world in pursuit of his passion. 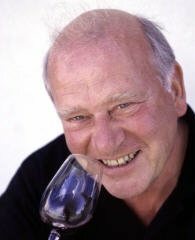 25 years later, at the age of 49 when some of us are looking towards winding down into an early retirement, Peter Althaus knew he wanted to make wine, and wanted to make it in the southern hemisphere. He travelled extensively, inspecting possible sites in New Zealand, Argentina and Chile, looking for a vineyard site that offered a genuinely cool climate “because of its latitude, not altitude,” he says. Eventually his travels took him to Tasmania, where “I drove around, tasting and getting to know the land.” Soon, Althaus says he “fell in love with the place,” particularly a particular site he visited called Stoney Vineyard. Though not for sale at the time, Althaus let the owners know that should things ever change, he’d be interested in having first refusal on the land. Six months later, a phone call came out of the blue to say the Stoney Vineyard was being put on the market and the rest, as they say, is history. Althaus says it was at first “a hobby vineyard of about an acre.” There were seven different varieties planted, and Althaus remembers his first vintage producing just 25 litres of of Sauvignon Blanc. He set about wholesale changes to the vineyards, replanting at higher density with new trellising systems. Althaus produces two ranges, all from estate fruit: the fighting weight Stoney Vineyard, and the altogether more serious Domaine A, which was tremendously impressive. See all Domaine A stockists on wine-searcher.com. Lovely nose that is very tropical, with notes of candied peel, mango and papaya and a real pineapple juiciness. Very little ‘green’ character to this Sauvignon. The palate is fine and bold, with plenty of savoury acidity and a racy fruit quality giving lots of mouthwatering succulence. Barrel fermented then racked and back into barrels for one year. Minty, bright, vanillin and mint humbug aromas dominate, becoming more toasty on the palate. Lovely depth of spice-edged, ripe, very bold fruit. Lots of racy acidity with citrus, but more opulent nectarine and pineapple notes through the mid-palate. Very long, with a shimmering quality of acidity playing against the creamy oak and juicy fruit. Lovely style. Tasmania’s temperate climate and cool nights help set style for this Cabernet which spends a year in older French barrels. There is a distinct aroma of eucalyptus and methol, with a broad juicy palet of mulberry and cassis fruit beneath. This is a very pungent style of wine. 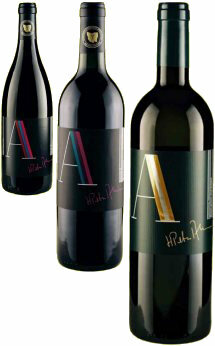 On the palate it is quite light and racy, with crisp, savoury liquorice and juicy black fruit. Lots of cut and crispness to this wine, as well as good fruit. This has a much smokier, incense and spices character than the 1999, with crushed blackberry fruit, a little touch of eucalyptus again, and a dusty, black fruit character. On the palate there is a herbal note here, perhaps even a touch green, but savoury and interesing, with a lean and muscular framework with sweet black fruit showing through and good length. becomes more appealing with each sip. Cabernet Sauvignon, Merlot, Petit Verdot and Cabernet Franc are matured in all new French barriques for 24 months. Again that hallmark eucalyptus note is present from the start, with smoky, deep, mulberry fruit aromas layered with tobacco and cedar. There’s a distinct peppery note too. On the palate this has real juicy ripeness, with a flood of blackcurrant fruit that is glossy and svelte, edged with liquorice, but bursting with fruit. It has real structure too, with big, but supple tannins and a fine acid balance. A lovely wine with time ahead of it. Minty and deeply smoky, with touches of pencil-shavings and camphor. Very fine black fruit on the palate, with real concentration. There’s a fabulous sense of density and blue/black firmness to the fruit through the mid-palate, with plenty of sweet blackcurrant, melding with polished tannins and well-balanced acidity into avery long finish. Another impressive wine that is worth cellaring, with perhaps a touch more concentration. Nice to taste a maturing example, especially as Peter Althaus says his Domaine A cabernet needs 10 years to show its best. There’s a much more opulent, enticing layer of briar and cedary pencil-shavings on this wine, with a touch of woodsmoke and leather, but it is still very nicely focused on solid black fruit. On the palate that mintiness is there, but this 11 year old wine is just brimming with sweet, copiously ripe black fruit that is glossy with cassis and black cherry crispness. Quite firm tannins still give plenty of grip in a terririfc wine. Very meaty, meat-stocky nose. Extremely savoury, with a slightly green, or menthol note. Palate is rounded and much more harmonious. Soft, yielding berry fruit, but a bit of structure too. Liquorice and black cherry grippiness starts to dominate. Plummy acidity, but some chocolate in the finish to fill it out. Quite well balanced, and very unusual. Again, dark stock cubes and Bovril aromas are most unusual, and still very evident in this 13 year old wine. There are also delightful truffle aromas and glimpses of a floral character, with violet notes. It has really beautiful, quite seductive depth and smoky, earthy qualities on the palate, with gamy flavours and hints of coffee along with ripe black berry fruits. This has sensational length and is very fine indeed, with an orangy acidity and supple tannins still giving precision and length in the finish. What a nice wine this is, and I’d have every confidence the 2000 would go the same way.